Sylvester Stallone is back in a last "Rocky" called "Creed". In this opus, Balboa became the coach of Adonis Johnson, the son of his charismatic opponent Apollo Creed. 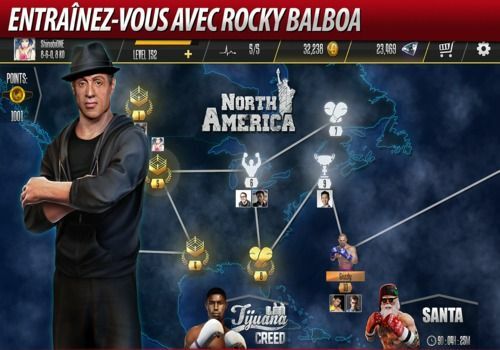 As you might expect, the real Boxing 2 Creed game is inspired by the movie. You will therefore not play Rocky (the manager) but rather Adonis. You will face off with hooks and uppercuts against fighters from all over the world and knock them down with special punches and technical combos. At each fight you will recover special equipment. You will define your own boxing style and choose between endurance, speed or power. Real Boxing 2 Creed also includes a character customization mode that allows you to create your own from start to finish. In multiplayer mode, you will face off against your friends in English PvP boxing matches. You will also find some cool little games that help to break the monotony of the ring but also to win rewards. So who will bite the dust? A successful mobile incursion for Mortal Kombat with this X version as violent and intense as the previous ones on console and PC.